I can’t resist this delicious Moroccan lamb dish. It’s very very simple, but really very delicious. It’s perfect for the BBQ without any hassle or complicated techniques – which is great when you have a hangover as bad as mine today. Soak 10-12 wooden skewers in water for a couple of hours. Mix together all the ingredients and leave, covered in the fridge overnight or for at least 2 hours. 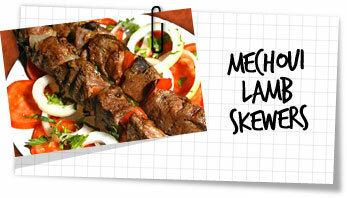 When ready to cook, skewer 4 or 5 pieces of lamb onto each skewer. Heat a grill or barbeque till hot, then cook the meat for 4-5 minutes each side till cooked through and charred slightly. Serve with salad, vegetables or cous cous.